California Work on the Road (pt 2) + Joshua Tree! The past few weeks have been really, really great. As you can see from the photos, I got to enjoy two more activities near the top of my so-called bucket list: Surfing and going to Joshua Tree National Park! I’ve wanted to learn to surf for at least a decade, and “painting” cacti for photos in Joshua Tree has been on my to do list for…well, about 10 years as well, I’d surmise. And to do this in addition to an amazing job? Yes, I feel pretty darn lucky. And after herxing on the Lyme meds again and getting sunburned beyond the point of pain, I decided to stop the medication. Ever since, I’ve been feeling great. After some time near L.A. and at Laguna Beach, we went to out to Palm Desert, all around Orange County, and everywhere north and south. We’ve been taking the Send Silence Packing tour to so many schools, from community colleges to well-known CA establishments. No matter where we go, we have such amazing conversations with people. And college students aren’t the only folks who see the display and talk to us about mental health; no, we get have long discussions with parents, high schoolers, professors, and strangers. It’s truly amazing how meaningful this work is, and though I can’t take credit for it, I can speak to as many people as possible. Yes, I’m one of those annoying people who hands out fliers, but what I really enjoy is the conversations I have with people who feel comfortable sharing their stories with me. As for travel? It’s been great, though I’ve done most hiking and exploring trips by myself. Lately I’ve been able to hang out with friends as well, so that’s been spectacular. And Joshua Tree? It was magical. Brandon and I had hoped to camp on a weekend, but upon arriving at the secluded south entrance, a tiny sign was posted on a blinking gate. Road Closed Due to Flooding. Seriously? We weren’t happy, but during a rare two days off in a row during the week, we made our way over. We got an amazing campsite at Ryan, then made our campfire, eager to do some time lapses with the stars. Photography entertained the two of us for hours, and I ended up taking hundreds of photos. Amazingly many of them turned out! We drew shapes with fire, we took photos of fire reflections, we painted cacti, and we did star time lapses. I was so pleased with so many of the shots, but you can’t get a sense of how amazing the trip was. At one point, probably around 2:30AM, we saw a moonset. The colors in the sky blew my mind, and the bright beams of the moon were incredible. Even Brandon’s mind was blown…you just had to be there. After the moon set, the stars came out by the thousands. You could see the Milky Way. Planes left light traces. We walked and whispered and crept into the desert at night (probably a terrible idea given that rattlesnakes enjoy nightbathing…) to get some shots of camp and whatnot. We painted cacti all in the desert, and I got some of my favorite shots of the campsites with fire light bouncing off of the giant boulders. It was really just surreal. At around 3:30, Brandon opted to go to bed…in the cab of the truck, naturally, playing video games on his warm computer to keep him from freezing. Hey, his words, not mine. So I shivered alone in my wee little tent. Having only one person in there meant that when high winds came through at 4AM, the tent went a-flapping all around me, sending noisy ripples throughout the layers all through the night. All through the night may be an understatement since I only slept a bit out of my 2 hours inside the tent. And even with 5 layers on, I was still freezing. At 6AM, our agreed time, I woke up Brandon and we headed out for a short hike. Already, purple and pink stripes were appearing over the mountains. We took off hiking (on a trail this time, and during daylight-ish) and I hopped up on one of the unique rock outcroppings to get a good view. It was…majestic. That’s the only word that can describe what it felt like to sit on boulders high above the desert and watch the sun come out, striking the next set of mountains with the brightest pink hue I’d ever seen. UFO-shaped clouds appeared over various mountain ranges throughout the day, the apparent byproduct of crashing wind currents. Brandon caught a few photos of me jumping–so much fun! After packing up camp, we took off to a different section (one my friend Victor recommended) and explored around there. Though just 10 minutes away from our campsite, the rock geography was completely different, and really felt like a playland for anyone who enjoys boulder hopping and hiking. I took quite a few photos of Brandon for his own project. Based on just one night of camping, I cannot wait to go back! It was simply magnificent. Too bad it was cut short by a schedule and a hungry and impatient partner. Previous hikes have included San Dimas, Palm Desert, and other little explorations. One of my favorite days was when I stumbled upon not just one, but TWO tarantulas! There they were, just climbing the mountain along side me. Crazy. A friend from a travel site I frequently use took me to a nearby beach and taught me to surf last weekend. It was a dream come true, and as imagined, surfing is not easy. I keep thinking about how I could have done better by standing up over here, or paddling harder at that point… Still, I think I did fairly well for my first time–at least, that’s what everyone said (Though doesn’t everyone always say that?). Another friend and I went on several food tours (our own exploration, no guides/books, of course) throughout Orange County. They were amazing. Taiwanese bread and noodles, bubble tea, Thai mango sticky rice, Mexican enchiladas, Chinese pickled beans and veggies…there were many dishes we sampled, and all were pretty awesome. Or, in the case of the pickled beans and veggies, at least interesting. Well, this was a lot to fit into one post, and I apologize for the terrible writing. I just had too good a time during work and play to sit and write down my thoughts. 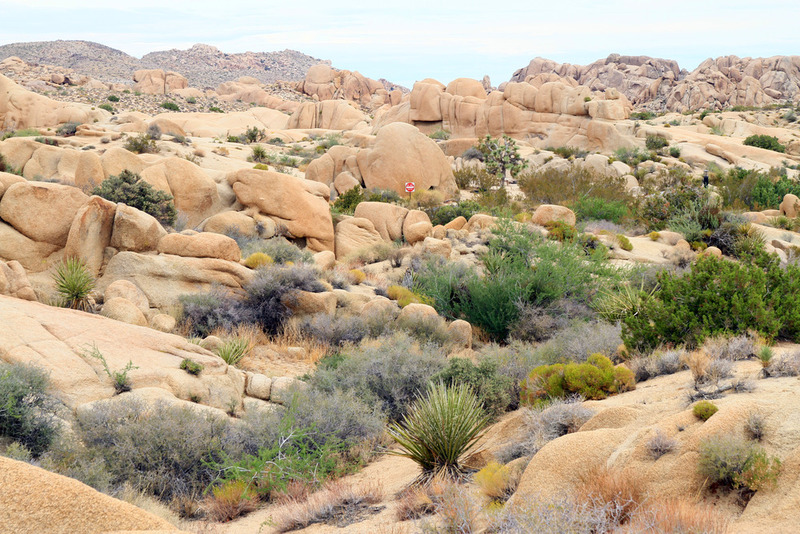 Joshua Tree was so amazing that you’ll just have to go. And as we wrap up the tour, I’ll be sure to post one more time after I arrive home. Until then, enjoy the photos from the past few weeks! This entry was tagged activeminds, antitouristtraveler, californiatour, exploring, hiking, sendsilencepacking, travel. Bookmark the permalink. (1) That is out of control. LOVE. (2) does this mean you are coming back to nyc?!?!? (2) Of course! Back on Friday. Still working on that project? (2) sweet shot! safe travels. (4) Wow, Kathryn! What great shots!!! I really enjoyed looking through them. Hope all is well. All the best to you! (8) that is a great shot! (8) You are an inspiration. (18) beautiful…the view and you! 😀 hope you like this comment! (18) and how did you get so high!? (19) True, but think of those whiffs of yankee elitism you’d have missed out on while grilling in December. (20) That is scary as hell! (23) OMG! you went surfing!Awesome! I want to go surfing!! !